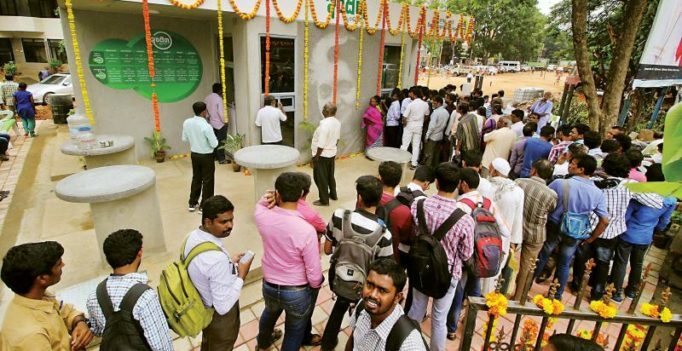 Bengaluru: It was brisk business at the Indira Canteens on the second day of their opening. But many people, who visited the canteens across the city, came away disappointed as they either had to wait for hours to be served or not be served at all with all the food being sold out early. In the absence of centralised kitchens in most places, the food was cooked in a wedding hall at the Palace Grounds and supplied to a large number of canteens, clearly showing the hurry the state government was in to get the project off the ground even without proper arrangements in place. Although each assembly constituency is supposed to have a centralised kitchen to prepare the food and supply to the canteens, only six of the 28 assembly constituencies in the city have kitchens, while the rest are still in the process of acquiring them. At many other canteens food was sold out within minutes and those who came later were greeted with empty vessels. Many of those, who were served, were not satisfied with the quantity of the food given. Although each helping was to have 300 grams of rice, 150 grams of sambar and 50 grams of chutney, the quantity was much less, complained several dissatisfied customers. “We doubt if the rice supplied to us was 300 grams. Perhaps one plate of food was divided into two to meet the demand,” said Mr Rajeshwaran, a visitor at a canteen in Chaluvadi Palya. Many visitors to the canteens felt the need for ragi balls on the menu as they are filling . Athough the Indira Canteens are meant mainly to feed the working class, several home-makers and college students from well- to- do families were seen visiting them out of curiosity to sample their food. They joined daily wagers, autorickshaw drivers, and police constables standing in queue for their food. Asked about the many problems at the canteens, Mayor G Padmavathi admitted to them, but assured they would be sorted out. “It will take another one week to bring things under control. Feeding thousands of people isn’t an easy task,” she said, also admitting that the food was cooked in a wedding hall in the Palace Grounds and supplied to many of the canteens.